‘Mine has as well,’ the neighbour said. It seems bizarre that a country shares its name with a supermarket. But there are lots of bizarre things about Iceland. For instance, the fact that more than half the population believe in elves, and the horses (no bigger than ponies) have an extra gait, and one in ten of the population are writers. The first time I heard of anyone going there was in 1995 when I got my first job teaching at the University of East Anglia. I remember feeling a pang of envy. It seemed so far away, at the edge of the world. My colleague came back flustered talking of glaciers, geysers, green-rocked landscapes and horses. Even before reading Philip Pullman I vowed to go one day. No one I knew shared my dream. The general response to Iceland (the country) in Portugal is that you have to be mad to go somewhere so cold. Almost twenty years later since I felt that pang I set off in the camper van with Leo and make our way to England. It takes six days. A few rainy days later, I board the three-hour flight to Keflavik airport. Sitting next to me are two young men who have hitched from the French Pyrenees to London to get the flight. It has taken them three days. They plan to camp in a lava field and watch the northern lights from their sleeping bags. It is okay, they tell me. Their sleeping bags can cope with -15. I am pleased I am not that mad. As we fly north the seas flatten out and the clouds slowly disperse. We scribble in notebooks and look out the window as Iceland comes into view. The tips of volcanoes and mountains look like they have been dipped in icing sugar and the lowlands draped in dark velvet. The afternoon light is pink. I am part of a group of (slightly mad) people from all over Europe who have come to Iceland on a three-day riding holiday in October. Many of us are on our own. 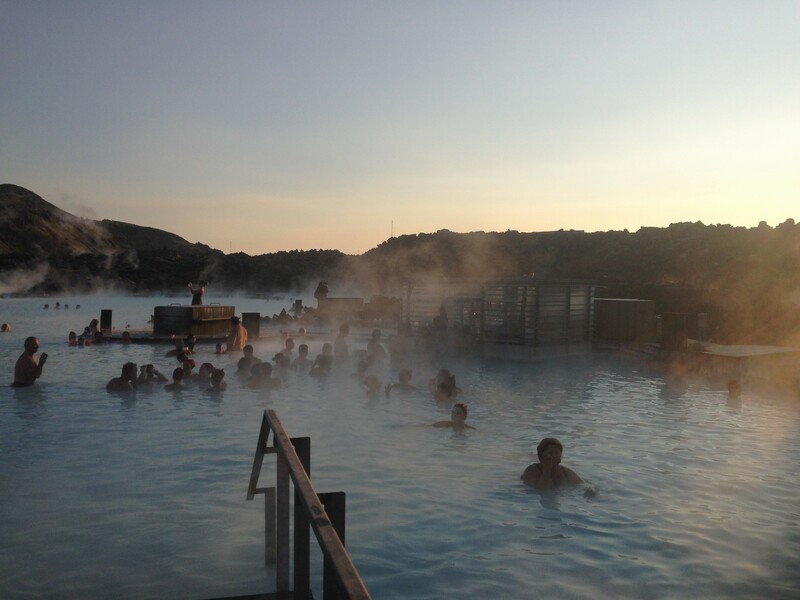 Our first stop is the Blue Lagoon and soon I am moving slowly through the hot blue lake, lost in the steam, gazing at the dark jagged lava beyond. A bar in the middle of the lake sells cocktails, wine and beer. Many of the bathers are young and beautiful. It almost feels like a film set and, indeed, a famous actress (I am told) floats by with her family. The water hugs me and I drift to a shore where the rock has become white and smooth like a ceramic bath tub. I lie there watching the baby-coloured sky and the setting sun, the turquoise water and the white steam. I’m sure I see shadows dart into the rocks. I close my eyes and think of the long journey to get here. Already it is worth it. I shiver as I get back on the bus. ‘Iceland very cold,’ the driver says. ‘Good that we have volcanoes. Or you would need to drive more cars so we get some global warming.’ Only the glint in his eye gives away his humour. It is cold. When the bus gets a puncture we all troop outside to have a look. ‘It’s the tyre,’ the driver says and squats down to take a closer look. I think he is waiting for some elves to come and help him. Fortunately, one of the Danish women in our group is a truck driver and she is soon under the bus undoing the bolts and bang-bang-bang the tyre is off. ‘Will you marry me?’ the bus driver asks the Danish truck driver. She thrusts the jack at him and we get on our way again. The road is new and empty. There are only 320,000 Icelanders (excluding elves). Pockets of apartments, warehouses and shops glimmer in the dusk – as if they’ve been miraculously built during the night. There are no people. Strange stone sculptures scatter the rocky landscape and Icelandic horses graze. It is dark when we arrive at the farm. The smell of horses and lamb stew fills the warm dining room. After dinner we go out and look up into the sky but the sky is empty and cold. The cold bites my hands and nose and I can’t help worrying about the French men in their tent. A young woman, Philippa, is rereading Northern Lights. I was already teaching when I read it but the enchanting landscape of the arctic north, going closer to the end of one world and the beginning of another, propelled my dream to head north one day. The morning dawns candy floss pink. We get our miniature horses, saddles and bridles and we set off at a walk crossing rivers and through a recently planted wood. The mud is covered with a thin layer of ice like a nightshirt. We crunch through it and then when we reach higher ground we sit back, heels down and legs slightly forward and trr-trr-trr-trr-trr-trr-trr-trr-trr. 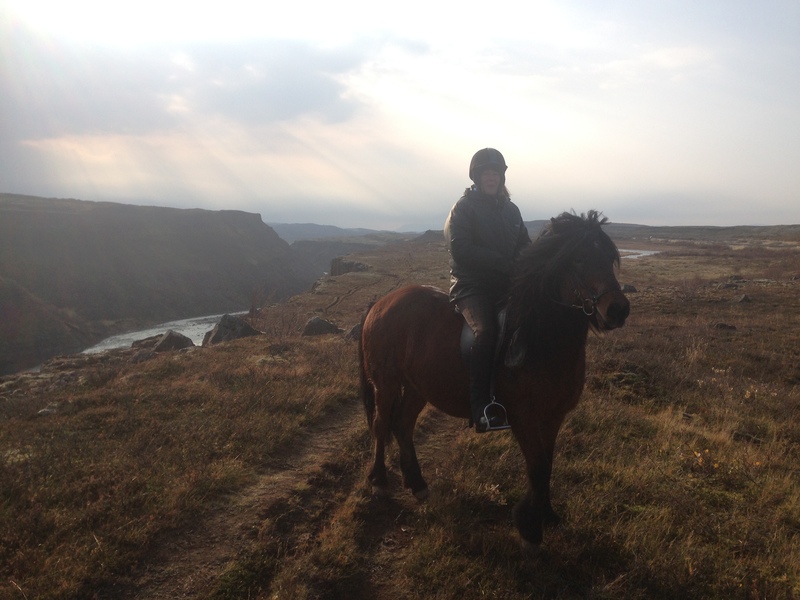 This is the tölt, the magical fifth gear of the Icelandic horse which enables them to travel vast distances. When it clicks in the pony flies beneath you, the front legs curve like cresting waves, its seat as smooth as a sofa. We pass a geyser, its hot steam spewing out of the ground. Tourists gather round taking photographs and gasping every time it explodes. Hot water runs down the road. That evening we are eating dinner when another one of the Danish women (a ship’s mate) comes in and says casually, ‘You want to see the lights?’ We all rush out. Sure enough a green band is draped across the northern sky. A spell has been cast. No one really speaks except for a few curses at cameras and iPhones that refuse to photograph the transformed sky. It is cold and yet the night envelopes and hugs. I feel as if I can almost touch the green ribbon but it is just out of reach. I give up trying to capture the light and go for a walk on my own. The Aurora casts a hue over the land as if a magic coat has been thrown over the night. I imagine elves coming out and constructing cities and building roads. And bears in the mountains and witches flying on broomsticks. The band of light narrows and widens in places but it doesn’t dance. Tonight it is lazy like a snake slowly digesting. It fades slightly and the cold grabs me. We walk to a pub on the edge of a lava field. The bar looks new as if it has only just been built. I have a sense of shifting landscapes. Buildings appearing and disappearing. I get lost walking back and find myself walking into the darkness. I feel like I’ve been tricked but I don’t feel scared. I’m almost waiting for someone to take my hand. By the time I get back to the farm the green light has gone. The next day the sky is hungover and the wind is grumpy. We saddle up our horses and set off trr-trr-trr-trr-trr-trr-trr-trr-trr. We pass a river of melted glacier that thunders down the valley. To fall in would mean death within seconds. We ride alongside the canyon of Hvítá. It is cold, very cold. The wind punches my face and my toes and fingers have long lost consciousness. My ‘all weather’ riding gloves do not include Iceland. I put my frozen fingers into the shaggy fur of Tyrfill, my warm chestnut horse and trr-trr-trr-trr-trr-trr-trr-trr-trr. The wilderness and cold is paused by the cafe at Gullfoss waterfall. Tourists watch as we unsaddle and then rush to the warm and order soup and coffee. I buy some gloves. ‘This is all new,’ Elka says, a woman from the Netherlands who has been coming to Iceland for twenty years, as we walk down walkways to the waterfall. The water crashes down the rocks and spray rises twenty metres into the air. ‘But it is still beautiful,’ she adds. I can’t help being grateful for the warm cafe. ‘Iceland very cold,’ the driver reiterates as he drives us back to Reykjavik.